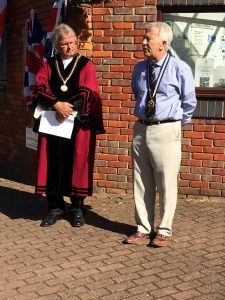 A series of events have been arranged across Buckingham to commemorate the passing of 100 years since the end of the 1st World War. 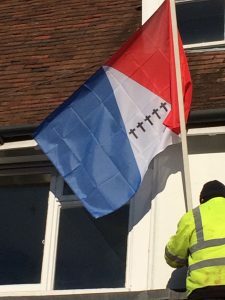 Buckingham Town Council has spent the week putting up Remembrance flags across the town. The Lest We Forget: Army, Navy and Royal Air Force flags have been provided by The Woolpack and the Armistice flags have been provided by Lionel Weston with support from the Royal British Legion as part of the Armistice 100 event. Mayor, Councillor Jon Harvey attended the launch of the Royal British Legions’ Poppy Appeal at the Old Gaol on the 23rd October alongside councillors and volunteers. 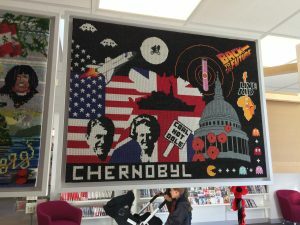 Already open is the Tapestry Exhibition, a series of tapestries symbolising each decade since 1918, organised by Lionel Weston and hosted by Buckingham Library. Each tapestry is the work of local artists, both young and old and hand made by local crafts people after over two years of planning and work. The Old Gaol has held a series of exhibitions around the 1st World War, with the latest opening today and focusing on The British Army in Italy. 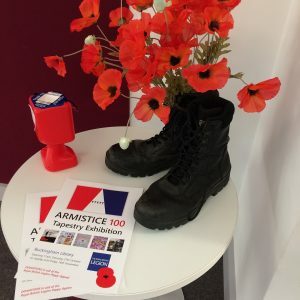 On Saturday the 10th November, Lionel Weston in support of the Royal British Legion has arranged for 10 young people will travel as Silent Soldiers through Buckingham, each one representing and displaying the story of a real person who once lived in Buckingham. At midday these soldiers will gather outside the Old Gaol as a tribute to the fallen. 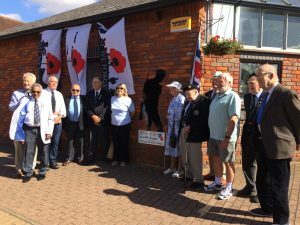 The Silent Soldier campaign is also marked by the black outline of a soldier currently fitter to the side of the Buckingham Town Council Chamber. Sunday 11th November will begin with the Royal British Legion leading the Remembrance Parade. The parade leaves market square at 10.30am and continues towards the War Memorial at the Parish Church where Hon. Milly Soames will take the salute. A rolling road closure will take place for this event. 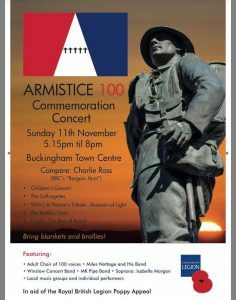 In the evening of the 11th November, from 5.15pm the Town Centre roads will again be closed from 4pm for the Armistice 100 Commemoration Concert. Charlie Ross (BBC’s Bargain Hunt) will compere a range of local artists and musicians including The Suffragettes, Winslow Concert Band, Miles Nottage and his Band, MK Pipe Band, Isabelle Morgan and children’s and adult choirs. This event is organised by the Lionel Weston with support from the British Legion and Buckingham Town Council. At the close of the month the Radcliffe Centre will host a play about W alter Tull Walter was the first mixed race officer in WW1. Before joining the British army he was the first mixed race professional footballer, an extremely talented man who played for Tottenham Hotspur and then Northampton Town. The play has been written by a local resident and will be performed on Friday 23rd, Saturday 24th and Sunday 25th of November, sponsored by the Royal British Legion, University of Buckingham and the Arts Centre. Tickets are available from the Tourist Information Centre, Old Gaol, Buckingham. This entry was posted in Events, News by Louise. Bookmark the permalink.